Honor your beloved and your marriage with a special wedding band that embodies the beauty and sanctity of your bond. 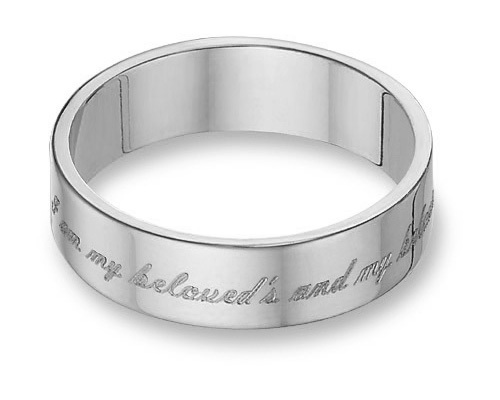 This solid 14K white gold band does just that with an elegant inscription of this verse: "I am my Beloved's and my Beloved is mine," from Song of Songs 6:3. These endearing words are carefully engraved as a joyful reminder of the wonderful gift of marriage. A comfort fit design on the inner band makes wearing this ring not only beautiful, but comfortable, too. Made in 14k solid white gold. Also available in 14k yellow gold, sterling silver, or platinum (by request). We guarantee our "I am Beloved's and My Beloved is Mine" Wedding Band, 14K White Gold to be high quality, authentic jewelry, as described above.